An overload of smoothie pictures have accumulated once again, so I’m sharing five new smoothie combinations today. It’s a good thing my kids love smoothies! If smoothies aren’t your thing, come back tomorrow for some wonderful Rosemary Bread. 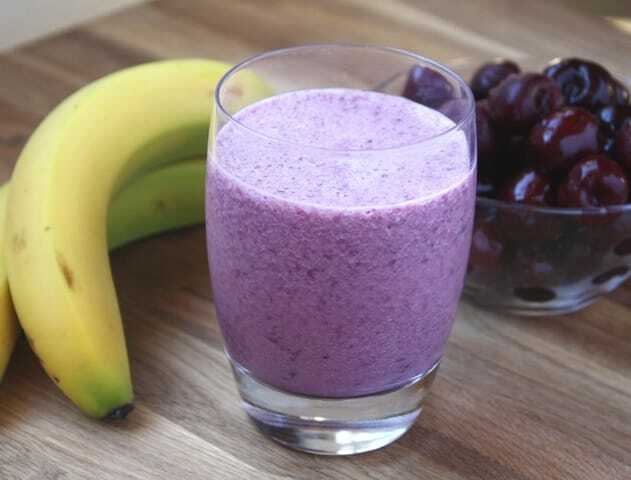 Cherries and bananas combined here to create a delicious frozen smoothie. The frozen fruits really made this smoothie the success it was. I’m sure it would be delicious with fresh bananas as well. However, if you have the chance to freeze them first, I would. 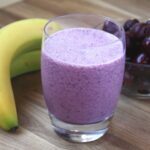 The cherries were a nice change for a smoothie and I’ll definitely be using them again. Layer the ingredients into the blender in the order listed. Puree until smooth. Lovely colour and sound refreshing. Cherries and banana sound delicious! Hey the smoothie turned purple! Never knew that you can extract purple from cherries. But then again, cherries don't grow in the Philippines so I don't have much experience with them. Thanks for sharing your smoothie combos! I'm going to try and make this with bananas and oranges instead since I don't have cherries! Wish me luck! With the Cherry banana smoothie could I add some chocolate protein powder and some chocolate nibs end up with a cherry chocolate flavored smoothie? Sure thing. I love how adaptable smoothies are and that sounds delicious.